1 reversible uniform (shorts, jerseys) owned and provided by team. These are returned at the end of the season banquet. 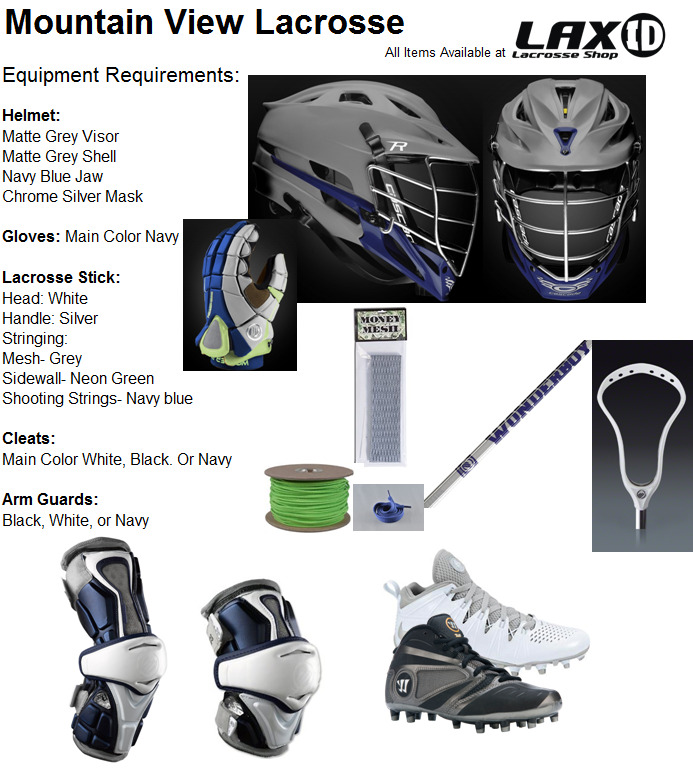 Men's Lacrosse Stick and mesh, Helmet, Elbow pads, Shoulder pads, Gloves, Mouth Guard and Protective Cup, Cleats, Socks. Equipment pictured below are examples of items to purchase. Only the helmet must be the exact brand as in the picture. Varsity requirements- Matte Grey Helmet- If you need to replace your helmet and are JV, this is the helmet to purchase, otherwise you do not need to purchase a new helmet to play JV. The lacrosse stick is composed of the head, pocket and handle. You can purchase a complete stick or purchase the items separately to get exactly what you want. If your child is just starting out in lacrosse, it is best to go with a complete stick. Many kids will think they need a brand new stick, when all they need is the stick restrung. Take your stick with you to the store and they can normally give you some advice if just a new pocket will do. Made of plastic and come in various models. Beginner sticks have a larger face and wider scoop to make it easier to pick up and catch the ball. Advanced sticks vary in features based upon the player's position, playing style, and skill level. The head must be 6 ½ inches at the top and at least 10" in length from the ball stop to the top of the head, except for the goalie stick. The three main pocket choices are Hard Mesh, Soft Mesh and Traditional. Soft Mesh is intended for beginners and allows for an easier catching pocket. Hard Mesh is the most popular and allows for a more consistent pocket and a harder throw. Traditional is made up of nylon cord and 4 leather pieces. Traditional pockets can provide a better feel of the ball in the stick, but require constant maintenance that is normally above the beginner to intermediate player. Available in 4 sizes, Attack/Middie Length (30"), Defense (60"), Box (32") and goalie (40"). Most complete sticks come with a standard aluminum handle, which is fine for most beginners. Upgraded handles are available in various alloy metals and composites. Upgraded handles are stronger and/or lighter than standard aluminum. We do recommend purchasing an upgraded handle for the experienced defensive player, as the aluminum handles tend to bend and break easily. A helmet consists of the shell, face mask, chin strap, visor and chin. The most important aspect in buying a helmet is to ensure the proper fit. Have the store personnel make sure the helmet fits properly before you leave. All lacrosse helmets are required to have a NOCSAE certification on the back. This certifies the helmet meets the protection standards for lacrosse. All lacrosse helmets provide essentially the same protection. Prices vary based upon the weight, features and feel of the helmet. If your child is in High School or will enter High school in a year or two, try and purchase the helmet colors that are appropriate for their school, so you don't have to buy another one later. Be very careful when buying used helmets and ensure that there are no loose parts, rivets or bolts. Stick checking in lacrosse requires players to protest their arms with elbow pads. Most elbow pads use some sort of Velcro to keep the pad at the appropriate spot on the players arm. Each model provides various protection and comfort features. For youth players below the high school level, a basic entry level arm pad will do. Entry level pads cover the elbow, and a significant amount of the forearm. As a player progresses and solidifies their position and style of play, they can make a more informed decision as to what will work for them. Attackman need the most arm protection, Middies slightly less and Defenseman sometime may opt for a neoprene sleeve. A word of caution. There is a trend in lacrosse for kids to wear the bare minimum pads. While this trend comes from watching college lacrosse players at the highest levels, most kids do not have the muscle mass on their arms to absorb a hard check to the forearm with no padding. It is best to err on the side of too much protection than not enough. The main reason players wear shoulder pads in lacrosse is to protect their collar bones against a stick check. Pads vary from the bare minimum (cover just the collar bone) to high tech pads that protect the shoulder, upper arm, front chest and back. A good entry level shoulder pad will cover the upper chest, collar bone, shoulder and upper arm. These can be had for about $30-$40 and will work for most kids that don't have a prior shoulder injury. Football shoulder pads are not recommended as they do not provide enough freedom of movement above the shoulder. Probably the second most important piece of equipment, after the stick, since it is the one piece of equipment that connects the player to their stick. Lacrosse gloves protect the hand against stick checks and the ball. The main differentiating factors between price points are protection, flexibility and materials. Entry level gloves are made out of a durable cloth, while higher end gloves are covered with synthetic leather. Gloves come in 4 main sizes, 8" 1-3rd grade, 10" 4-6th grade, 12" 7-10th grade, and 13" Adult. These are just estimates as everyone's hand varies in size. Make sure your child tries the glove on at the store to make sure they get the proper fit. Buy a mouth guard that connects to the helmet. It will save your child from losing it on the field. A player cannot play without one. Pretty simple and available at most sporting goods stores. While no one will check your child on this issue, don't let them play without it. If your son already has soccer cleats, stay with those. They'll work fine. With any footwear, fit and comfort are the most important features, not price. If you're looking to buy a lacrosse specific cleat, look for something with a speed cleat (cleat directly under the toe). Football cleats are the most common. Stay away from baseball cleats.